Oticon hearing aids are considered to be the world’s best hearing aids. Are you currently using outdated technology from other hearing aid companies and looking to upgrade? Or have you noticed hearing decline and want to learn if Oticon hearing aids would be a good solution for you? Our comprehensive review of Oticon Opn 1 outlines why they are the best hearing aids on the market today. A hearing aid is an electronic device that is made up of a microphone, receiver, amplifier and small battery. With the fast paced growth of digital technology and electronic design, hearing aids today are so small that they are practically invisible when worn. Oticon hearing aids are useful in improving the hearing and speech comprehension of people who have hearing loss. This decline in hearing ability results from damage to the tiny sensory cells located in the inner ear. Hearing aids magnify sound vibrations entering the ear. Hair cells within the inner ear detect larger vibrations and convert them into neural signals that are sent to the brain. The greater the damage to a person’s hair cells, the more severe the hearing loss, and the greater the hearing aid amplification required. The first step in determining if you need hearing aids is to take an online hearing test. The short online hearing test allows you to think about everyday listening situations and how they affect you. The results of your online hearing test will help provide insight about your hearing and indicate if you should see an audiologist for further evaluation. An audiologist is a licensed hearing health care professional who specializes in the diagnosis and treatment of hearing loss. Audiologists conduct exams, treat balance disorders such as tinnitus (ringing in the ears), assist in hearing and speech rehabilitation programs and fit and adjust hearing aids for their patients. If your online hearing test results indicate you are experiencing hearing loss you should visit your family doctor. Once you discuss your hearing issues with your doctor they can refer you to a local audiologist to have your hearing tested. Audiologists typically recommend you visit once a year. Your annual checkup allows the audiologist to identify any developing issues that could become more serious. During your appointment your audiologist will test your hearing to track your hearing loss decline. After your hearing test they will connect your Oticon Opn 1 hearing aids to their computer. They can see how often you’re using your hearing aids as well as what kinds of sound conditions you are exposed to regularly. If your hearing aids ever need to be repaired, your audiologist will send them directly to Oticon to get fixed. Oticon hearing aid repair typically takes under one week. Audiologist Nicole Clark at The Oakville Hearing Centre. Auditory Processing Disorders: occur when the brain has problems processing the information contained in sound, such as understanding speech and determining where sounds are coming from. Conductive Hearing Loss: occurs when there is a problem with the outer and middle ear which interferes with the passing of sound to the inner ear. It can be caused by a build up of earwax, ear infections, punctured eardrum, fluid build-up, or abnormal bone growth such as Ososclerosis. Sensorineural Hearing Loss: occurs when the Cochlea, or auditory nerve is damaged and as a result can’t accurately send information to the brain. This is the most common form of hearing loss. It can be genetic or caused by the natural aging process, diseases, accidents or exposure to loud noises. Oticon Opn hearing aids can help reduce the effects of sensorineural hearing loss. Mixed Hearing Loss: occurs when both conductive hearing loss and sensorineural hearing loss are present. For example, mixed hearing loss can occur when a patient with Presbycusis also has an ear infection. Invisible Hearing Aids: also known as Completely-in-Canal (CIC), these hearing aids are placed deep inside the ear canal, hidden from sight. Despite their small size, invisible hearing aids contain the latest technology and provide hearing quality similar to larger models. Behind the Ear Hearing Aids (BTE): consist of a plastic casing that contain the electronics. Amplified sound travels through a clear plastic tube into an earpiece, forming the connection to the custom made earmold in the users ear. Oticon Opn 1 are behind the ear hearing aids. In the Ear Hearing Aids (ITE): these hearing aids are placed inside the ear and consist of only one part into which the electronics are built. The shell is custom made from an impression your audiologist makes of your ear canal. Open Fit (OF): open fit hearing aids use a combination of elements specially designed to deliver sound from your hearing aid into your ear. All of the elements come in various sizes, making this particular model instantly custom fit. It’s important to research all hearing aid companies before making a final decision at your audiologist office. You will want to ensure you are buying the best hearing aid brand for your unique hearing loss condition. Hearing aids cost a lot of money and typically last 3-5 years. So you want to compare hearing aid price to ensure they are within your budget. It’s important to remember that the best hearing aids for one patient may not be the ideal solution for the next. Audiologists typically recommend patients purchase new hearing aids every 3-5 years. It’s important to research hearing aid price and cost so you can budget for the expense. The largest hearing aid cost is the device itself. You will also need to pay for annual checkups with your audiologists and hearing aid batteries. Many people looking for cheap hearing aids search online for Walmart hearing aids, Costco hearing aids and Amazon hearing aids. Remember that not all hearing aids use the same technology or provide the same quality of hearing assistance. It’s best to consult your audiologist to determine what the best hearing aids are for your type of hearing loss and budget. The average hearing aid price in Canada and the US typically ranges between $2500-3500 per device. Depending on where you live in the world your private or public health plan may include hearing aid insurance. It’s best to consult your audiologist to learn what hearing aid insurance you qualify for. In some countries the cost of hearing aids, hearing aid batteries and audiology appointments are partially covered by a public health plan. In other countries like the United States, Medicare does not cover any of the costs related to hearing impairment. In Canada, each province is responsible for offering its own hearing device program. In Ontario, adults and children with a valid Ontario Health Insurance Card are eligible to receive 75% coverage of the cost of one or two hearing aids up to a maximum of $500 per hearing aid. The subsidy is available once every three years. Consult your audiologist to learn about other government programs you may qualify for related to your age, income, and disability profile. Hearing aid repairs are usually covered under warranty by the manufacturer for 2-3 years. Hearing aids usually break down due to ear wax and moisture getting into the electronics. Ask your audiologist to provide a hearing aid dehumidifier to store your Oticon Opn’s when you’re not using them to increase their longevity. Once using Oticon Opn hearing aids your largest annual expense will be the purchase of hearing aid batteries. Oticon hearing aids use size 312 hearing aid batteries. When using your hearing aids consistently 312 batteries typically last one week. Pharmacy: we visited five major pharmacies to determine the average cost of hearing aid batteries. The average cost per battery was $1.10. Audiologist: we called five audiologist offices to determine the average cost of hearing aid batteries. The average cost per battery was $0.80. Costco: Costco sells a 48 pack of hearing aid batteries for $12.98. We determined that Costco offers the best price for hearing aid batteries at $0.27 a battery. Oticon Opn is the very first hearing aid to effectively help users cope with noisy and dynamic environments. Oticon’s groundbreaking technology is fast enough to support the brain and precise enough to differentiate between sounds. With the extreme speed of Oticon’s new hearing aid technology users are provided with more accurate information about the soundscape. They’re also enabled to more easily locate and separate sound sources. The result is a significant improvement in the ability to understand speech in complex environments while, at the same time, preserving mental energy. This new ultra-fast platform brings market-leading frequency resolution with 64 channels. The high speed platform analyses the environment more than 100 times per second and handles more than 500 million instructions per second. It is 50 times faster than the processor from Oticon’s previous generation. Historically in the industry when a hearing aid manufacturer launched a new chip there would be a gain of 20-30% more capacity. Velox has 5000% more capacity than the processor that came before it. You see why Oticon Opn has created a paradigm shift in the hearing aid industry! Oticon Opn’s revolutionary new feature balances sound and noise sources to provide 30% better understanding of speech and noise. Instead of using traditional directional strategy to hear speech in a noisy environment, Oticon hearing aids offer access to all distinct speech sources regardless of where they are coming from. Hearing aid users understand there’s a compromise to the traditional directional microphone mode. The standard, old technology focuses a narrow beam of amplification in front of the user, helping to hear the voice of the person you are facing. But that’s not helpful if there’s a voice you want to hear anywhere other than where you are pointing your nose. There’s active suppression of sound all around you so you lose out on the rest of the environment. Velox allows Oticon Opn hearing aids to process all speech, balance it for distance and direction, and tune for any interfering noise without using narrow beam directionality. Oticon Opn’s OpenSound Navigator technology offers a better experience for hearing aid users as it’s a more natural way to hear. Oticon Opn’s new Spatial Sound LX combines a number of advanced technologies to provide a more precise spatial awareness to help users identify where sound is coming from. When we lose our hearing the quality of sound to our brain is degraded. Spatial Sound LX uses timing and intensity differences of sounds, compares them across both ears, and gives priority amplification based on distance and direction. This new Oticon hearing aid technology organizes all the sounds in your space the way your brain would if it was getting high quality signals. Oticon Opn’s TwinkLink technology makes it the world’s first dual radio system in a hearing aid. Two communications systems operate at once! Near Field Magnetic Resonance: allows Oticon hearing aids to communicate with each other to share sound information from both sides of the head. This helps present inputs properly balanced for where you are in your environment. These helpful cues allow the user to properly localize sound. Bluetooth hearing aids: stereo bluetooth low energy 2.4 GHz allows connectivity to external accessories like the iPhone without the use of an intermediary relay device. 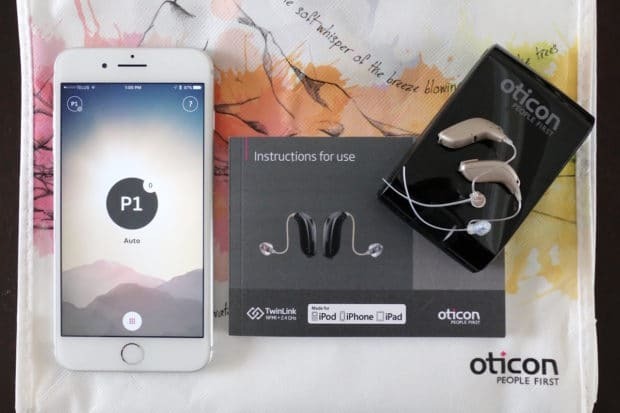 Apple fans will love using Oticon hearing aids as they can connect seamlessly to iPhone, Apple Watch, iPad, Mac and Apple TV. Oticon hearing aids have a nano coating of all vital components from the inside out. They are designed to be worn in all daily life situations. If you’re looking to purchase waterproof hearing aids, rest assured that Oticon Opn users do not have to worry about sweat at the gym or getting wet in the rain. Oticon hearing aids are not intended to be worn while showering or swimming. You can manage your Oticon hearing aids with the flick of your finger thanks to an iPhone hearing aid app. The easy-to-use Oticon Opn app seamlessly connects your bluetooth hearing aids to your favourite Apple products. Select your audiologists pre-programmed settings to suit your changing environment. Oticon Opn app settings can include Auto, Noisy Places, Mute, Apple TV and iPhone mic. Easily adjust the volume on your Oticon hearing aids. Craft your own connections using an IFTTT service (If This Then That). You can explore endless possibilities of connecting your Oticon hearing aids to doorbells, lighting systems, email, text messages and more. You can even connect your bluetooth hearing aids to the coffee maker in your kitchen. Imagine waking up each morning to turn on your hearing aids and minutes later a hot pot of coffee is waiting for you downstairs! Check the strength of your hearing aid batteries so you know when they’ll need to be replaced. Find your hearing aids on an interactive map. Ideal for those stressful moments when you accidentally leave your Oticon hearing aids at a friends house or drop them in your car. Oticon Opn’s latest update offers the world’s first hearing fitness technology. Just like your favourite iPhone exercise app, HearingFitness tracks hearing aid use and provides insights you can use to improve healthy behaviours. These insights are based on big data analytics that combine lifestyle and healthcare data with local sound environment analysis. Oticon Opn is made for iPhone. These bluetooth hearing aids seamlessly connect to your favourite Apple products such as Mac, iPad, Apple Watch, and Apple TV. When directly connected to iPhone, the hearing aids double as a wireless headset – without the need for an intermediary device. The iPhone therefore doubles as a remote control for Oticon hearing aids. Play music from iTunes directly into your ears. You’ll never need to purchase or use headphones again! Stream incoming calls from your iPhone directly into your ears. Conversations over the phone have never sounded so clear! Hear videos clearly while watching movies on iPhone, iPad or Mac. You’ll rely less on subtitles to follow along with your favourites films! Watch your favourite TV programs with crystal clear sound when your Mac is connected to your Apple TV. Coordinate health data with your Apple Watch to provide personalized insights via HearingFitness. Oticon Opn works seamlessly with iPhone. When using Oticon hearing aids the iPhone acts as a remote control, making it your most important hearing aid accessory. Any sound you would typically listen to via iPhone’s speakers will now play directly through your bluetooth hearing aids. With Oticon Opn you can now easily take phone calls, watch videos, and listen to your favourite music. Now that you are using Oticon hearing aids it’s important to purchase the latest iPhone as it acts as Oticon Opn’s remote control. Apple is constantly launching new innovative products so it’s important to do your research. You want to ensure you’re buying the model that is best suited for you. Oticon hearing aids works seamlessly with MacBook and iMac. Any sound you would typically listen to through your MacBook or iMac speakers will now play directly through your bluetooth hearing aids. With Oticon Opn you can now easily enjoy Facetime calls, watch videos, and listen to your favourite music on MacBook and iMac. Oticon hearing aids works seamlessly with iPad. Any sound you would typically listen to through your iPad speakers will now play directly through your bluetooth hearing aids. With Oticon Opn you can now easily enjoy Facetime calls, watch videos, and listen to your favourite music on iPad. 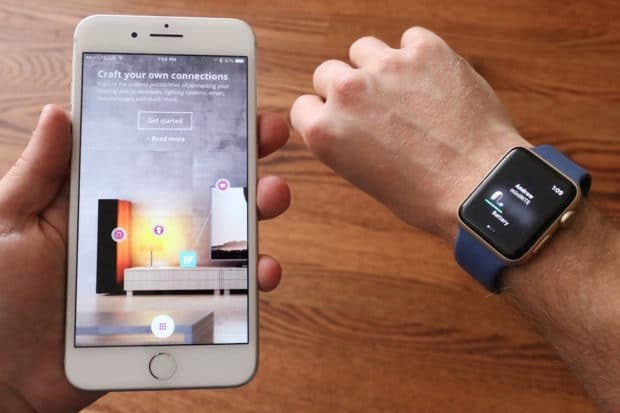 Oticon hearing aids works seamlessly with Apple Watch. Oticon Opn’s can now easily sync your iTunes playlist on Apple Watch to your bluetooth hearing aids. Oticon’s new HearingFitness app also works in conjunction with Apple Watch to provide personalized health data. Hands-free workouts have never been so dreamy. Enjoy crystal clear sound during your next Netflix binge when your Apple TV is paired to your Mac, iPhone or iPad. Oticon hearing aids can connect to your Apple TV through these devices to make your daily entertainment experience at home more clear. Oticon Opn’s can communicate with your Apple TV up to a 15 metre range.